Purchasing a cemetery memorial before a death occurs is one way to simplify estate planning responsibilities. Rome Monument has Cemetery Planning Advisors that can help families and estate planners with the process of choosing and purchasing monuments and memorials before a death occurs. When people buy headstones and gravestones before people have been buried it is called "pre-need" or advanced planning. 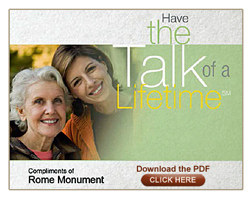 Rome Monument's Pre-Need Planning Advisors help you plan ahead to purchase a cemetery memorial or gravestone. What are you going to do when a death occurs? It's important that each person has a pre-arranged plan. Planning your estate? Let our on-staff Cemetery Advisors make pre-arrangement planning comfortable for you. Begin this process with our Pre-Need/Advance Planning Advisor service. Prearranging cemetery memorialization is one of the most requested services that Rome Monuments offers, and has become a common part of the estate plan for today's families. Ensures you will receive the type of cemetery memorial you want. Guarantees your gravestone marker fits within the stipulation of your cemetery plot. Locks in the cost of your memorial, regardless of inflation of material costs. Rome Monuments free Pre-Need Planning Advisor is here to alleviate the pressures that can accompany choosing a cemetery memorial and gravestone by helping you plan ahead. Call 724-770-0100 or click here to contact a Pittsburgh Cemetery Planning Advisor.